Register now, spots are filling up fast! Confirm your spot by clicking the registration link above. Space is limited, don't wait! On behalf of the Northern Exposure Tournament we want to thank you, your families, and your players for attending the 13th Annual Northern Exposure Tournament. We know it is a huge commitment from everyone who attends and we strive to make our tournament the best possible experience for everyone. We were very happy with how the tournament went this summer both from a competitive hockey and event execution standpoint. 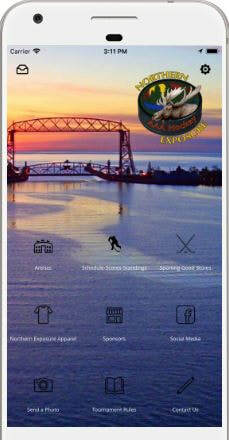 Hopefully you experienced the same and had a great time on and off the ice while in Duluth. We are working to finalize dates for next summer and will email you when we know. This should be within the next week. Hope everyone has a great rest of the summer! Our sponsors help us keep our tournament registration fees down. Take a moment to visit our sponsors page. Ready to plan your trip? Learn all about Duluth hotels, restaurants, and many awesome things to do here. Register for the tournament by clicking here. Visit the information tab above for more tournament specific information. Find out who is in our tournament, view our master schedule, and our individual level schedules and pool breakdowns here. Want an even better tournament experience? Keep up with scores, find your way around town, connect, and much more by downloading our tournament app! Using your mobile device click the image to get started. Want a better tournament experience? Download our app!